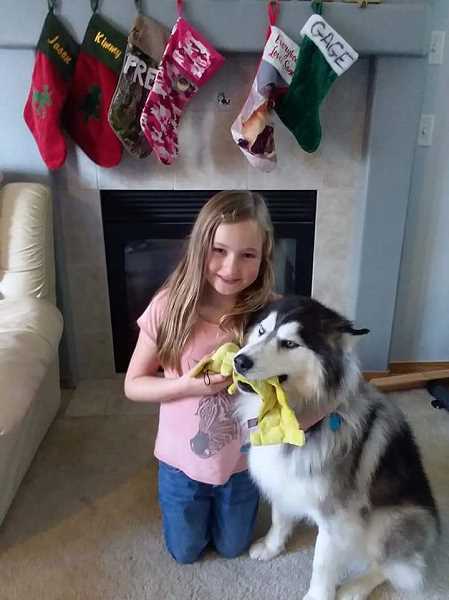 When Jason and Kim Cobb of Woodburn brought home an early Christmas present for the family, their 8 ½ -year-old daughter, Karlie, was delighted. 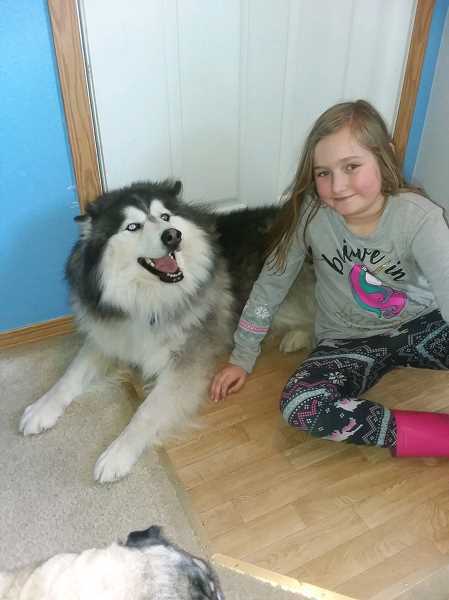 The present, a rescued husky-malamute mix name Gage, was welcomed into the family, which had endured the passing of a 10-year-old family pet of similar breed earlier that year. 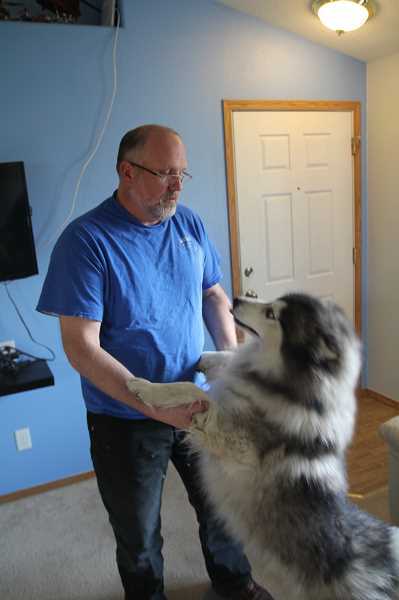 "We got him in about November because we had a malamute before," Jason Cobb said. "He passed away and so we were wanting to get another dog for Christmas." They saw Gage on the website of a rescue shelter in The Dalles. Circumstances were that the Cobbs couldn't get up to see Gage for another week, and they were hoping he would still be available for adoption. "My daughter fell in love with him and so did my wife," Jason said. The adoption was on, and so were some new challenges for the family. 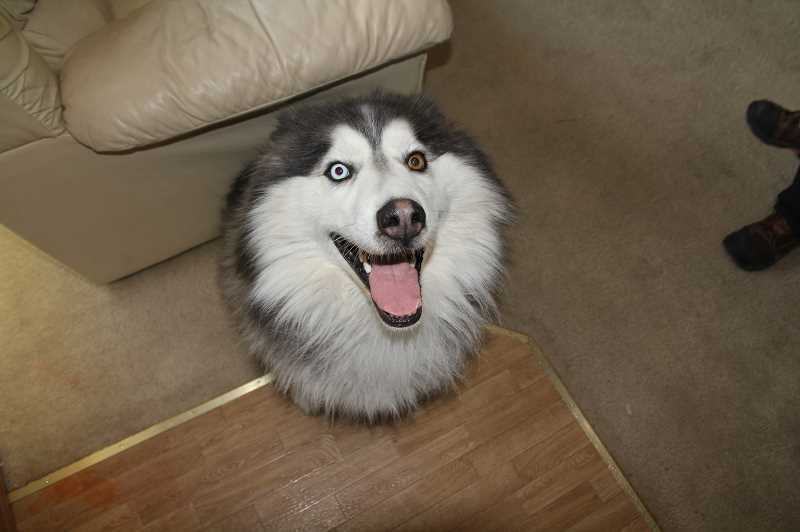 "I found out really quick that he was an escape artist…most huskies are; you see of them on lost-pet sites all the time. They are smart that way, and they can climb," Jason said. In fact, rescue-shelter staff came to work one morning and discovered Gage was out of his kennel and walking around on the shelter roof. Knowing the dog's wiles, the Cobbs covered their bases. Jason and Kim decided they would not only affix ID tags on his collar, but they added a GPS tracker and had a microchip inserted at the kennel. The latter step proved vital. In the wee morning hours of December 5, Gage decided to set out on an adventure. Kim discovered him missing and immediately pinged the tracker. 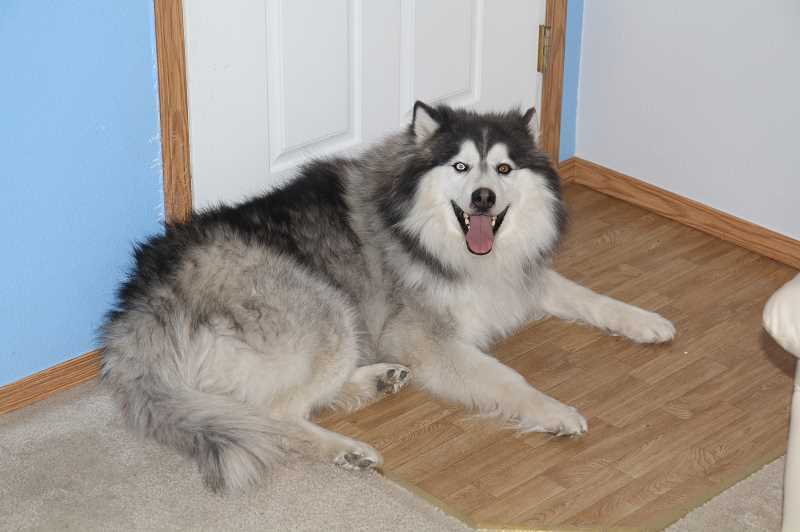 She set out from their west Woodburn home, and appeared ready to find him, but instead she just found his collar on sidewalk next to a Super 8 Motel – few blocks away from home. The Cobbs checked phone messages; they heard from workers at a nearby Arco gas station who said they saw him heading up the street. By the time the Cobbs arrived, around 4:30 a.m., they couldn't find him – that was the last anyone had seen of Gage. They posted on Facebook with Lost and Found Pets of Woodburn and Lost and Found Pets of Oregon . "They are really good around here at finding pets," Cobb said hopefully. But days passed; then weeks; then months. "I didn't think he was coming back," Jason said. "We had a little glimmer of hope there because he was microchipped. But when they are gone that long, you start to lose hope." They figured someone had taken the collar off, since it was securely fastened; not even Gage was Houdini enough to slip that. Karlie was especially upset; the second dog she had parted with in a short period of time. But she didn't give up hope. "My daughter prayed every single night for 3 months that he would be safe, and that he would finally turn up," Jason said. Those prayers were answered when first Kim's then Jason's cell phones rang late on March 14. "It was late, and both of our phones rang, so I thought it might be an emergency," Jason said. "I answered my phone, and it was a vet clinic up in Olympia Washington, calling to tell me that they had my dog. "I was in shock. Wow!" 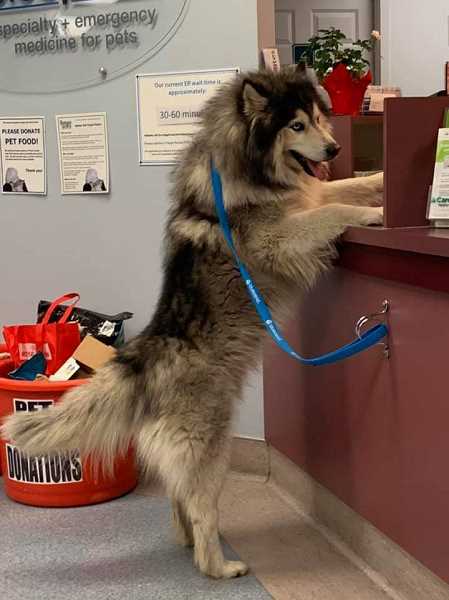 A Good Samaritan informed them that she discovered a dog of his description hanging out with homeless youth bivouacked near I-5 in Olympia, Wash.
She said her concern heightened when she saw Gage roaming near the freeway. So she very cautiously finessed him out of the camp and to a veterinary clinic where she could check to see if he had a microchip. He did, and late that night the Cobbs were heading north for a midnight meeting at a truck stop near Castle Rock, meeting the woman halfway to be reunited with their dog. Jason wanted to take care of it, but Kim insisted that he not go out alone at night to meet a stranger at an unfamiliar location. They bundled up Karlie and set out for Cee Cee's Truck Stop, located just south of the Cowlitz River at a vague locale between Castle Rock and Toledo. A sleepy-eyed Karlie was dozing in the car while they met up. But she brightened up immediately when she heard familiar paws pad into the car. "Gage! Is it really you? It's really you!" One advantage of a GPS tracking device is that it not only pinpoints but records activity. Jason logged into it and scanned back to December 5 where it showed Gage's steps, a circular meandering that didn't stray too far from their home. The woman who found Gage in the homeless camp had queried some campers as to whose dog he was. They told her the dog showed up when the kids from Arizona came to the camp. She located the Arizonans in the camp and asked them, and they said they found Gage on the freeway. Jason and Kim dispute that, since the GPS doesn't map him anywhere near I-5. They believe the nomads found him roaming somewhere near McDonalds, took the collar off, and then took off with the dog. But the Cobbs are quick to admit, it's merely their belief. The important thing is Gage is now back home. The outdoor winter thickened his coat, but the homeless campers apparently fed him well. Kim even felt bad for the nabbing nomads. "They took pretty good care of him. And in a way, they lost their dog, too," she said. Gage matured a bit during his near 100-day adventure. He's slightly more somber than he was months earlier, although he still gets extra excited when Jason comes home from work. Gage, a very affectionate, loving sort to guests and family alike, reveals his favorite part of the day is when he and his "siblings" head to the dog park to play. He has two siblings at home: the Cobb's 5-year-old pug Frankie, and the recently added boxer-lab mix, Katie, a puppy they brought into their home this month. "I said if we get a puppy, Gage will turn up," Kim laughed. "We did, and he did. But we're keeping all of them." Jason added: "And they will all be microchipped. "Gage wouldn't be home today if we didn't have him microchipped." Veterinarians, directors of animal shelters, pet-rescue operators and animal humane societies are all in step on one topic: make sure your pet can be identified if lost. The most full-proof identification is a microchip. "Having identification and contact information attached to your pet's collar makes it more likely that you will be able to be reunited with your pet if he or she is lost. However, collar tags can break or become unreadable, and tattooing can become illegible or covered with hair and difficult to find. In order to improve your pet's chances of returning home if lost, we recommend microchipping." That concurs with the American Humane Association, which "encourages all pet owners to take the added security precaution of having their pets microchipped. Microchipping serves as a permanent identification system that will always be with your pet. Nearly all animal shelters across the country routinely scan every animal upon intake for the presence of a microchip. Most veterinary clinics also have microchip scanners." AHA and the American Veterinary Medical Association shared some vital statistics to bear that out. More than 10 million dogs and cats are lost or stolen in the U.S. every year. Statistically one in three pets become lost at some point during their life. Only 58-percent of the microchipped animals had microchips registered in a database with their family's contact information. AHA sources stress that this underscores the importance of registering your pet's microchip and keeping it updated with your current contact information.